Stanford University scientists have developed a technology that could make the rapid urine tests frequently used in the doctors’ offices more reliable and accurate for at-home use. By addressing the most common human errors in dipstick testing — timing, volume of sample, and lighting — the technology could deliver faster test results to patients and reduce the burden on overextended medical laboratories and primary care doctors. While there are several at-home devices that can test for pregnancy, urinary tract infections (UTIs), or drug abuse in urine, these tests are often limited in scope. Rapid urine tests, which are commonly used during routine examinations to test for a variety of substances, rely on human interpretation of a color scale and are most effective when used in consultation with a doctor. Even when conducted in a professional setting, these tests often deliver inconclusive results. Bowden and her team set to work on addressing the most common causes for error with these tests. Inaccurate timing, too much or too little urine on the strip, and inconsistent lighting conditions where the sample is interpreted can all skew results significantly. The Stanford team’s technology is based on the rapid urine tests, which use a paper strip with ten square pads that test for different chemicals — such as pH levels, glucose, or proteins — and change color according to levels detected. To standardize lighting conditions, the Stanford team created a small black box into which both the urine sample and dipstick are inserted. A multi-layered loading system within the box ensures that the urine sample is distributed uniformly on the strip. 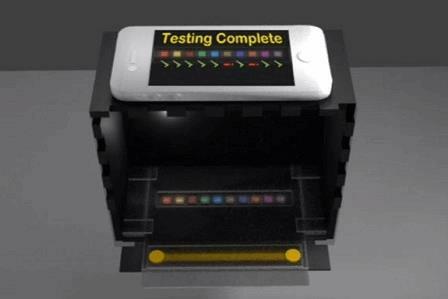 Accompanying software uses a smartphone camera to film the reaction on the dipstick, noting specific times when the color is analyzed to ensure accurate timing for each separate pad. The black box is designed to be low-cost and portable, using flat interlocking parts that are easy to assemble. According to Gennifer Smith, a PhD student on Bowden’s team, the technology is feasible for use in at-home care environments and in regions with scarce medical resources. Pressure from healthcare systems to cut costs has driven industry trends towards smart devices that can monitor patients from home, especially when managing chronic illnesses. In a recent Med Device Online column, Wayne Maddever, CEO of point-of-care (POC) diagnostic maker ChroMedX, stated that POC devices have been driving growth in diagnostics for the past 10 years and will likely play an even bigger role in the future.